Senator John McCain (R-AZ) has appeared on Meet The Press more than any other person in history, but these days it is hard to understand why. He is a true American hero, but he rarely offers anything insightful on these programs. Today was no different. 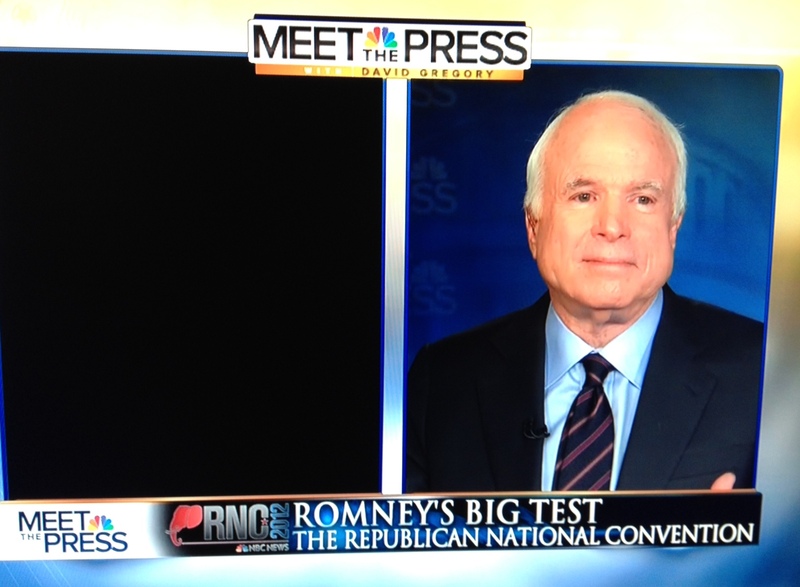 In fact, the satellite system itself seemed to be saying, “Let’s get this over with so we can hear Jeb Bush.” The feed from Tampa was lost ten minutes into the broadcast, leaving McCain all alone until a quick jump to commercial. Bush predicted that as President Barack Obama continues his negative campaigning, his likeability numbers will go down. And Bush says the economy will be the issue that tips the scales in Florida’s presidential election vote. Bush expressed his personal support for an immigration policy that allows people to stay here if they have earned a Ph.D or masters degree, so they “…can become the next generation of entrepreneurs.” In fact, he seems uncomfortable with what both Republicans and Democrats are saying and doing about immigration reform and does not think it should be used as a political wedge issue. He also seems OK with discussing ways for the government to raise additional revenues through things like increasing what some people pay into the Medicare program. In the roundtable, NBC’s Chuck Todd said party officials are discussing how a “tone change” in the convention may be needed (in addition to the schedule change) to accommodate the hurricane. Todd predicts there will be no bounce in the poll numbers for either candidate after the conventions. GOP strategist Mike Murphy predicts both conventions will be about Romney: One about building him up and another tearing him down (since Democrats can’t talk about their own record, according to Murphy). Todd said, “Ryan’s first name is ‘Congressman,'” and given the lowest poll numbers ever for Congress, it means the campaign took on a lot of baggage when they chose him as the running mate.